When a hitter is in the batting stance, their leading shoulder is more responsible for power production than the trailing shoulder. For a right-handed hitters the leader shoulder is the left shoulder and it is just the opposite for left-handed batters. An injury to either shoulder will affect a hitter, but an injury to the leading shoulder is far impactful. The leading shoulder deals with a tremendous amount of force at two points during the swing. First, when the hitter accelerates the arm forward and extends their elbow. Second, during the follow through the front shoulder has to decelerate the arm and bat. An injury would cause pain at both points. The body is very good at protecting itself subconsciously from pain. Despite a player’s best efforts, the body will decrease the amount of force produced to avoid pain. It has been interesting to read so much conflicting information about how or when Kris Bryant injured his left shoulder in ’18 (Bryant bats right-handed, so his Left shoulder is his front shoulder). The injury did not come to light until mid-June, but Bryant said the injury occurred a month earlier during a head-first slide. I reviewed many of his plate appearances from early May to early June and found this slide, which happened in game 1 of a doubleheader on May 19, 2019. Admittedly, this is my best guess at when the injury occurred, but no other slides appeared remarkable. Careful observation reveals that he leads with his left hand into the bag and his shoulder awkwardly accepts the force of the slide. I will spare you the anatomical details invovled with this particular mechanism of injury. In simple terms, this jams the top of the arm bone (humerus) into the outside part of the shoulder blade (acromion). Bryant later referred to the injury as a ‘bone bruise’ in an interview, which makes sense if this slide was at fault. 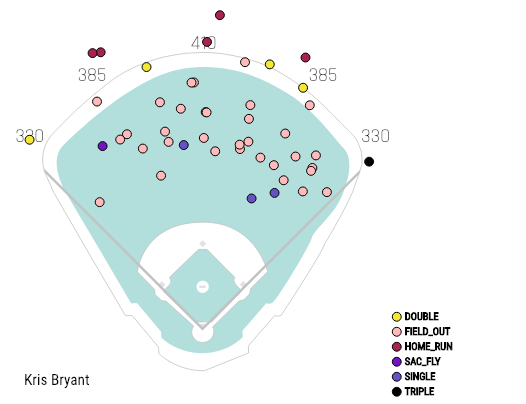 After May 19th, Bryant’s average fly ball distance was 28 feet shorter and had an exit velocity five mph slower. His fly ball charts are remarkable, with his lack of power on full display. As the season progressed, I was concerned that the Chicago Cubs didn’t pursue surgery. I was also worried that they weren’t proclaiming a clean MRI. Things weren’t adding up until Bryant’s recent interview at Cubs Convention gave a reason for optimism. No, it’s not because he touted his health either. Bryant disclosed two critical pieces of information. First, the nature of the injury being a bone bruise (among other things), and second, that he was shut down from swinging for nearly two months. A bone bruise can take months to heal and return to play didn’t help matters. 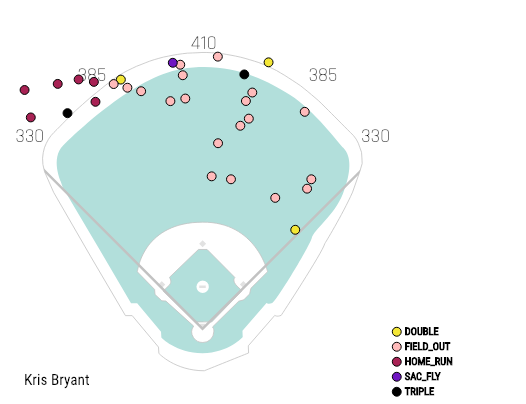 Bryant returned to hitting, putting incredible forces on injured tissues that likely caused prolonged injury to these already vulnerable tissues. Reading between the lines, we can deduce quite a bit of information. Progression from rehab to hitting requires achieving specific benchmarks. Often athletes encounter setbacks and aren’t cleared to being the next phase. The progress can be very slow. From the end of the season to early December Bryant responded well. Rest was likely the missing ingredient to overcoming the bone bruise. In the long-term bones heal very well. Internal structures like the rotator cuff and the labrum tend to hamper future performance. In short, it makes sense why Bryant wasn’t able to overcome this injury in-season. It is also very encouraging that he will rebound in ’19. I’m buying a slight discount (NFBC ADP of 34 at the time of this writing). We hoped you liked reading Kris Bryant Injury Outlook 2019 by Dr. Mike Tanner! I couldn’t agree more. Chili is a great coach from all accounts, but his approach didn’t seem to fit well with the Cubs. I’m hoping that change has a positive impact on Ian Happ too. Far too passive at the plate. I hope he feels like he can be himself. Just look what happened to the Red Sox the year after he left! JD Martinez happened to the Red Sox.